Referral marketing is one of the staple pillars of any successful digital campaign. Referral websites drive millions of people to online retailers every day. The categories above represent the largest revenue driving opportunities for beauty retailers. Every referral path is used in a slightly different way, but each is a valuable channel when it comes to driving qualified traffic to a website. We recently conducted a study that analyzed 26 of the top beauty retailers on the web today. The DemandJump platform collected inbound traffic data from commercially available sources of each website, their competitors, and referral sources going out three degrees of separation. The result is a map of the entire market ecosystem consisting of tens of thousands of sites that impact business, which, before now, could not be seen by marketers (download the entire study here). What we found was that affiliate websites make up an overwhelming majority of total visits from qualified traffic sources. Affiliates made up well over 70% of total referral traffic to beauty retailers (Figure 1). Among the top 26 beauty retailers, DemandJump identified over 250 affiliates that represent the lion-share of qualified traffic and revenue in the affiliate category. Over the past year, these five websites alone accounted for over 22 million visits to beauty retailers including ULTA, Sephora, and Folica. 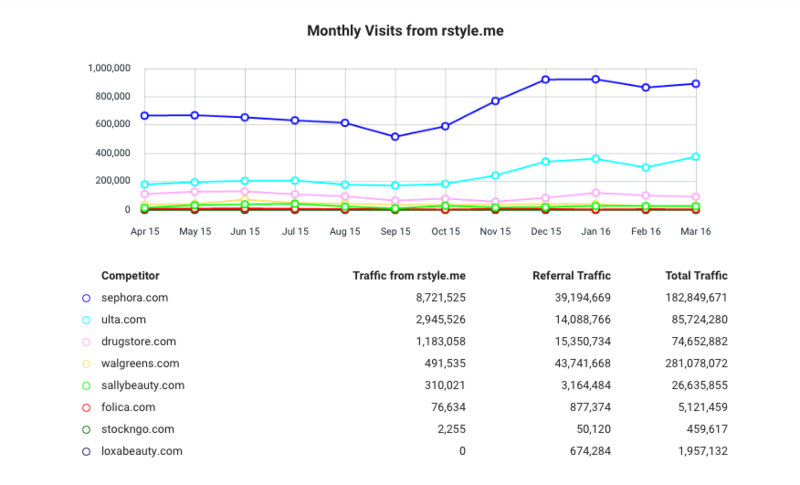 rewardStyle made up 22.9% of total referral traffic for Sephora—around 8.5 million total visitors (Figure 2). 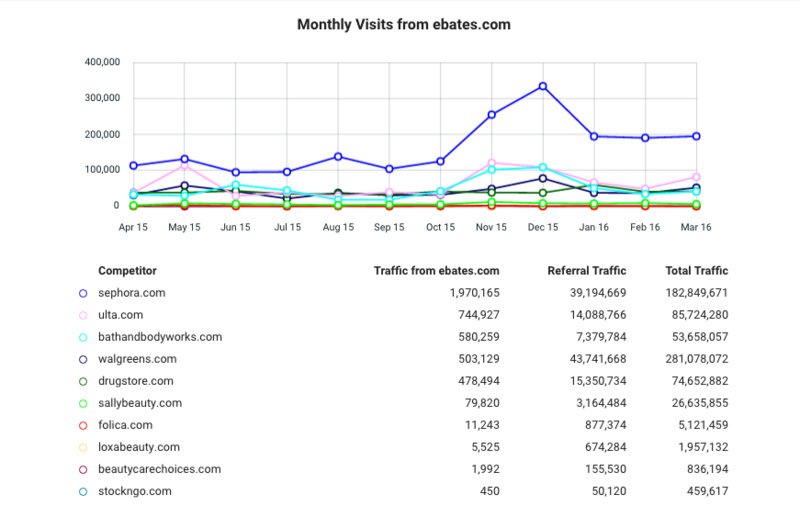 Ebates was an important affiliate partner for ULTA and Bath and Body Works, driving over 1.1 million visitors between the pair (Figure 3). Of the 26 beauty retailers examined in this study, RetailMeNot drove significant traffic to 18 of them. Qualified affiliate partners create a wealth of opportunity for any beauty retailer attempting to accelerate digital commerce. If long-term strategy places any evidence towards online retail growth, brands should be looking towards affiliate websites to drive traffic. Obviously affiliate partners should make up a critical aspect of any beauty retailer’s digital marketing strategy. But sometimes building and managing those relationships can be difficult. Rick Gardiner from iAffiliate Management published a great article on marketingland.com about some ways brands can improve affiliate relationships. He outlines five key ideas to keep in mind. This goes for any relationship in business. Often times we forget that people have other things going on. It’s important to respect their time and their communication preferences. And if you’re having problems figuring out what they prefer, don’t be afraid to just ask. Affiliate managers are looking for you to ask relevant questions. You don’t want to be in a situation where you aren’t understanding the affiliate’s needs. Even something as simple as researching the affiliate’s website beforehand can go a long way. Take Ebates for example. 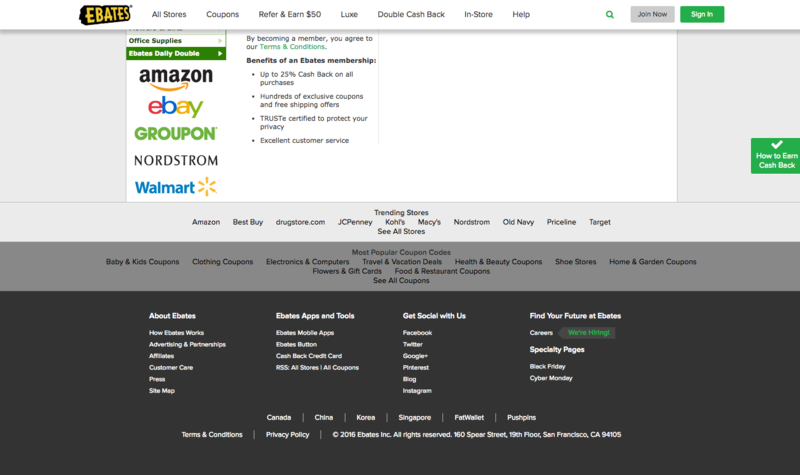 Figure 4 shows the footer of the company website with helpful links for how Ebates works, Advertising and Partnerships, and Affiliates. Once you understand each other’s needs, it is much easier to share ideas that benefit everyone involved. This is often one of the hardest things for marketers to do. Constructive criticism can be hard to hear at times, but it’s one of the best ways to improve your affiliate marketing program. Ask questions and work with your affiliate partner to optimize campaigns. Your success benefits your partner just as much as it benefits you. Feedback is more than likely going to be honest, helpful, and constructive. At the end of the day, a relationship between a brand and an affiliate is mutual. Success is two-sided, and a win-win attitude is critical. Provide your affiliate partners with anything that might help ensure a successful campaign. Building a microsite that includes marketing collateral or product-marketing materials is a great place to start. Always make sure that your legal texts, confidentiality agreements, and terms and conditions are up-to-date. Little details like this can go a long way. Affiliate marketing is a game of relationships. Don’t be afraid to be yourself. Being professional and understanding the business side of things is obviously very important, but beyond that, it’s personality that will make you memorable. Affiliate websites are a powerful traffic driver when it comes to online beauty. They account for an overwhelming majority of visits compared to news websites, commerce marketplaces, and blogs. There are several ways to maximize the relationship between you and your affiliate partners. Properly nurturing a healthy, mutually beneficial connection will pay off, especially in beauty. For more information about the state of online beauty, download our official report here. This comprehensive study goes deeper into affiliate and referral marketing, as well as content marketing, and social influencers. We’d love to hear what you think.